I loved the first two parts of this series so was delighted when a friend bought me the final book in glorious paperback as a present. Living in the Shadows, like the rest of the series, is quality through and through. This part is set in the late 1960’s and Mary and Peter Schormann are living a quiet life in Wales with their nearly grown up children, Richard and Victoria, who are at that late teenage stage where good and bad decisions are made over the choices that lie before them. Despite being twins, they are very different. Richard is studious and steady aiming for a career in medicine whereas Victoria is much less settled and causes a lot of distress by running away with the romantic idea of joining a hippie commune. Mary’s niece, Linda Booth, is working in a hospital as a nurse but an altercation with the husband of one of her patients awakens the past and secrets dating back to the war come back to haunt the present. 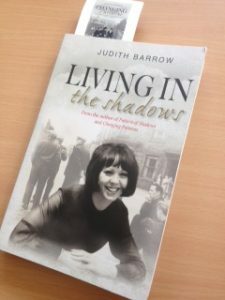 This author doesn’t rely on the image of the swinging sixties as a happy hippie time of peace and free love but shows the darker side, the side not viewed through rose tinted glasses I suppose. Therefore, homophobia, domestic violence and the more sinister view of hippie communes all feature and help to paint a more realistic feel to that time. Anyway, this is a totally compelling and absorbing series to get into and if you love excellently written family sagas with terrific characters and real life stuff going on then you will love these. I reviewed Changing Patterns here and Pattern of Shadows here.